Britain’s National Union of Students (NUS) is attempting to ban or “no platform” Nick Lowles, a man who has built a career denouncing perceived ‘Islamophobia’, because they say he is ‘Islamophobic’. Mr. Lowles is the leader of the hard left, foreign-funded Hope Not Hate (HNH) campaign group which claims to “campaign to counter racism and fascism”. But the very kind of mentality that Mr. Lowles has created on the left of British politics appears to have come back to haunt him – with hard-left students denouncing the group for briefly raising the issue of radical Islam. “Ultra-left lunacy” wrote Mr. Lowles on Facebook today. 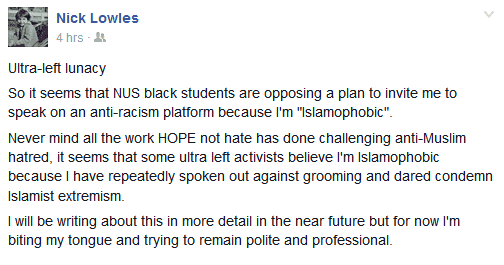 “So it seems that the NUS black students are opposing a plan to invite me to speak on an anti-racism platform because I’m ‘islamophobic’. “Never mind all the work HOPE not hate has done challenging anti-Muslim hatred, it seems that some ultra left activists believe I’m islamophobic because I have repeatedly spoken out against grooming and dared to condemn Islamist extremism”, he said. Prior to this, HNH frequently accused those who spoke about grooming of ‘Islamophobia’. Tommy Robinson, the ex-leader of the English Defence League, has even alleged that Mr. Knowles later “apologised” for not taking the problem seriously enough. The NUS attack on Mr. Knowles comes just days after they branded gay rights activist Peter Tatchell ‘racist’ and ‘transphobic’, and a couple of months after they attempted to ban the prominent Feminist Germaine Greer. In 2014, the student organisation managed to vote decisively to “formally condemn” and oppose “racist” and “islamophobic” UKIP, but declined to condemn this Islamic State (IS) terror group because that too would be “islamopbobic”. Despite this track record, many left wing politicians seemed surprised about the development. “No platformed by NUS for supposed Islamophobia. Beyond absurd,” tweeted Labour London Assembly member Tom Copley. 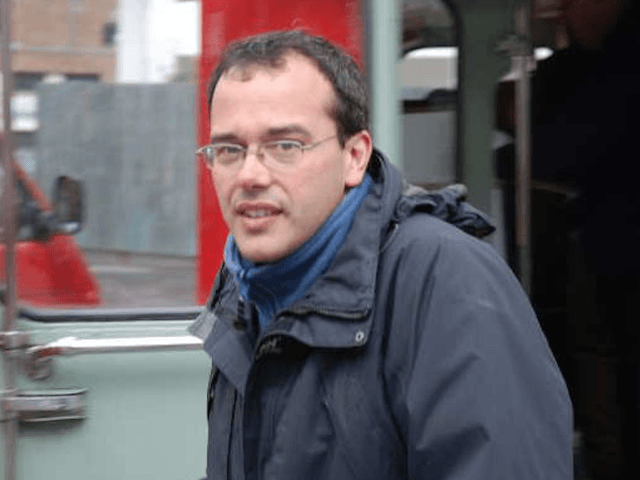 “Beyond baffling”, added Mike Katz, another Labour candidate for the London Assembly.